The Sunriver House in Sunriver Oregon includes 12 passes to the SHARC facility for our guests to use! SHARC is an indoor pool facility that blends the fun of pool recreation with the functionality of deep water lap swimming! It has a beach entry, tot bubblers, spinners and flowers, a vortex whirlpool, social bench and water basketball all adjacent to a 7'6" deep, 25-meter 3-lane lap section! It has a slide tower with two exciting water slides, and a lazy river water feature with gentle currents that move tube riders around an island! Includes a large pool deck and grass areas for sunbathing and lounging. There is even a Winter Snow Park complete with 3 different sledding runs! Gorgeous House W/Theater and Gourmet Kitchen! The house is 4200 square feet and is very roomy. The design allows for multiple groups to use various areas of the home at the same time. All bedrooms are master suites! Sunriver House is wired for Wi-Fi internet connection and is available to you at no charge! Telephone service is available with long distance included! We are located in an excellent reception area for cell phone service (most major carriers). We also offer a satellite system and DVD players for all televisions in the house! Blu-Ray is also featured! All set up in amphitheater style. This room will fully darken and, with the 72" theater screen, you are sure to have a true theater experience! BBQ on the back patio and relax next to the outdoor "See-Through" gas fireplace or, hang out in the Spa! The main Sunriver bike path is located just off the back corner of the property providing you with private access! 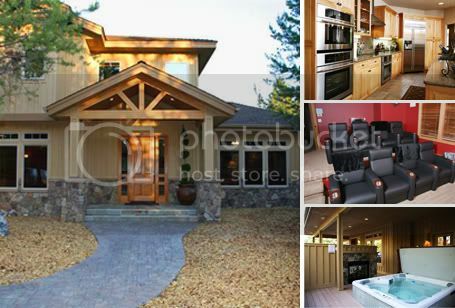 Relax in style on your next business or family vacation getaway in Sunriver Oregon. At Sunriver House, your vacation opportunities stretch from our doorstep to the beautiful surrounding areas of Bend Oregon, Sisters Oregon, Redmond Oregon, and Central Oregon. 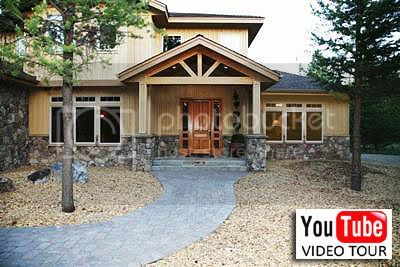 For a Video Tour, click here! To view guest reviews, please click HERE. To sign our guest book, please click HERE. Note: We take your privacy extremely seriously, and we never sell or distribute lists or email addresses. State of the art Theater Room (DVD and BluRay) complete with 8 custom leather theater seats and surround sound! Cable/Satellite TV: Blu-Ray is also available! We offer Satellite Dish 120+ Package. Video Library: Various family movie titles are available at the house. Video Game Console w/several games available. "What a great blessing this vacation was! Your home is fantastic. Thank you for keeping it in such good shape and so well stocked. The theater room was used every night and the bikes every day. Very special family time. Thank you just doesn't seem like enough to say but for lack of anything more poetic, thank you!! - John M., Tigard OR (Part of Patrick L. Party)" "Thank you very much for the amazing house. Our family loved every minute of our stay. Your home is gorgeous and so relaxing. Our kids loved the theater room and the bikes! God Bless you!! - Dusty C. (Part of Patrick L. Party)" "Thank you so much for such a wonderful place. We all had tremendous time with all our family and grand children. They loved the theater, bikes, swimming, [video] games, and having separate rooms! Thanks again, we really , really enjoyed our time here. "